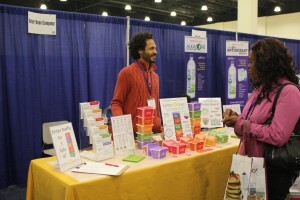 Gluten-free Expo in Portland! Sept 6th-7th. Gluten-free & More Magazine (previously Living Without) is hosting a line up of fabulous speakers (shameless self promotion below) and vendors both national and local. I went to their event in San Diego and we had a blast! In anticipation of the event the magazine had me write a travel piece on things to do in PDX and where to eat if you’re gluten-free. In celebration of the upcoming expo they’re allowing access to the article even if you’re not a current subscriber. You can find it here. If you have a business and you’d like to have access to the gluten-free food crowd, I’ve been told there are still a few spaces available as of the time I’m hitting ‘publish’ on this post. Contact Shelia (pronounced Shel-E-uh) at scafferty@gffafest.com. They are particularly interested in getting a few more more local vendors at this point so make sure they know I sent you! Below is my speaking schedule. Also on the docket are Tom O’Bryan who organized and curated The Gluten Summit earlier this year, Nadine Grzeskowiak, the Gluten-free RN, Alicia Woodward, editor of Gluten-free & More and our own local culinary stars Laura B Russell, Kyra Bussanich, and more! Are you gluten-free or considering going gluten-free? Dr. Samantha will clear up all of your confusion and questions about the basics of gluten-spectrum disorders and gluten-free diets. There is so much information and misinformation out there about testing, what you can and can’t eat, the differences between celiac disease and non-celiac gluten sensitivity, the impact of gluten on our bodies, laws about gluten labeling, and more. 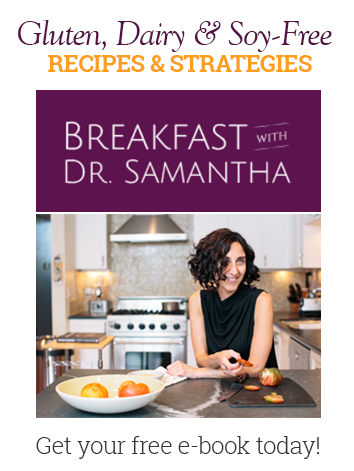 Dr. Samantha leaves no stone unturned and you’ll head out feeling relieved to fully understand the ins and outs of gluten-free living. Attendees will also get a link for a complementary copy of her soon to be published eBook- Gluten-free Essentials: What You Need to Know About Your Gluten-Free Life. In this session, Dr Samantha will explore the reasons you may still feel tired even on a gluten-free diet. From medical conditions to the foods you’re choosing, there is always a reason. Dr Samantha will expertly guide you in assessing which things you do and don’t have control over that may be making you tired, and teach you how to address them so you feel the best you possibly can every single day. Come for one talk or come for them all, eat a few samples or stuff yourself to the brim. It’s bound to be a fun, entertaining, educational and delicious weekend. See you there! While we were planning our trip to Italy, one place that everyone said we absolutely, positively, had to go was Cinque Terre. We had a hard time finding lodging there when we were doing our reservations, so we ended up staying in Levanto, which is just a bit north of Cinque Terre. Cinque Terre is actually five small towns in the Liguria region of Italy. They are Monterosso al Mare, Vernazza, Corniglia, Manarola, and Riomaggiore. When you see pictures of quaint villages with colorful buildings right on the coast of Italy, it’s pretty likely that the photos are of one of these towns. 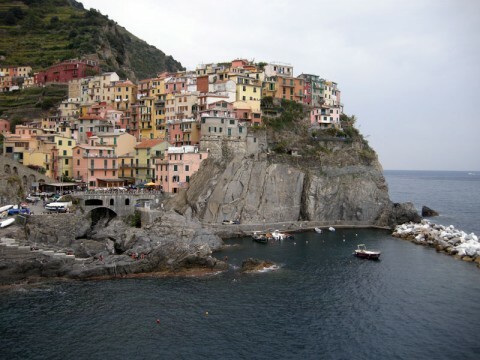 (That’s Riomaggiore pictured above.) There are trails connecting all five of them, and there is also a train line that you can take to travel in between them. Both the trails and train extend to Levanto as well, which was a good thing. 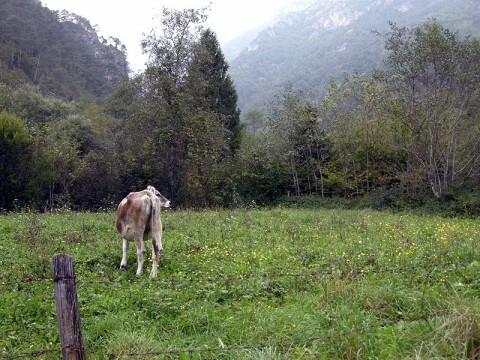 Liguria is famous for its food—for example, Pesto originated in Liguria. The place we stayed in Levanto was the Hotel Garden—two newly-remodeled floors in a building. I don’t know for sure, but would expect that the building is four floors? Hotel Garden occupies two floors. One is the second floor, and the other is the top floor. Apparently, the top floor gets booked up pretty early and is more expensive. The hotel is clean and the staff is friendly. They serve breakfast, which is the usual Italian fare: yogurt, salami, croissants, and espresso drinks. They do have high-speed internet, but unfortunately the Wi-Fi only worked in one spot in our room (coincidentally, Sienna’s side of the bed). Hopefully they have that fixed by now. (I was surprised at how inaccessible the Internet is in Italy.) The rooms that face the sea have balconies. They don’t really have a view because there’s a building between the hotel and the beach. The balconies aren’t private. 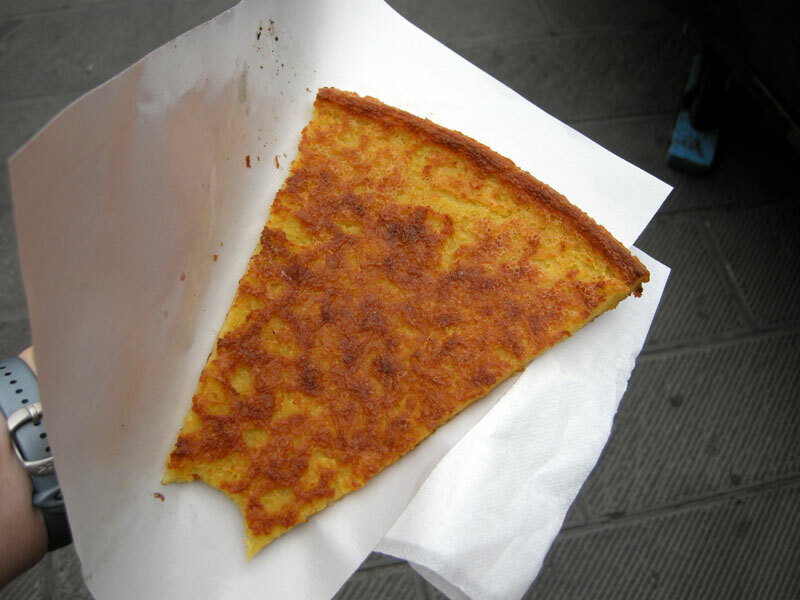 Farinata! This like a very thin pizza made out of chickpea flour. It is super-greasy but gluten-free and delicious. I don’t know if all farinata is gluten-free, so you should probably ask to make sure if you find yourself ordering some. Sardines! You may think that I’ve gone off my rocker, but fresh sardines are awesome! One of my favorite things to eat in Italy was fresh sardines and I was introduced to them in Levanto. 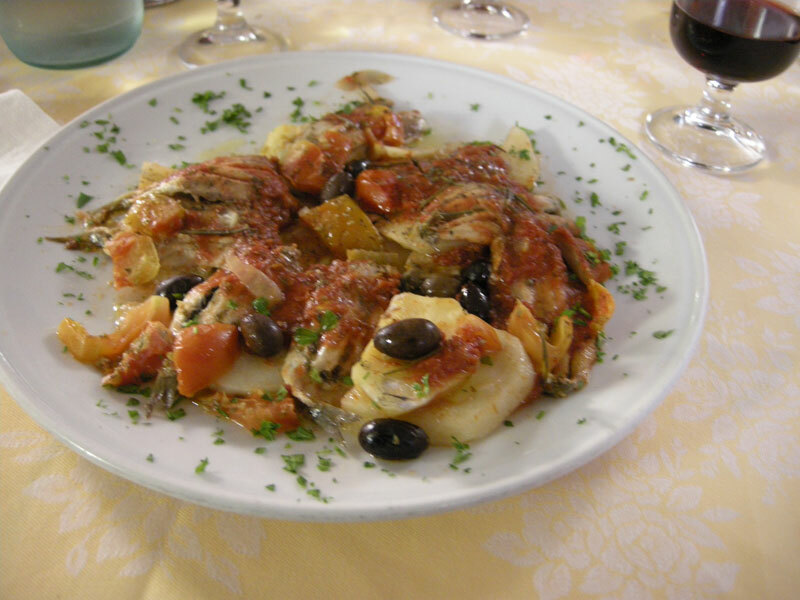 This dish was sardines, slices of potato, bell pepper, and olives in a light tomato sauce with lots of rosemary. I had this dish at a place called Pizzeria Bar L’Igea Di Nicora Fabio in Levanto, which we very strongly recommend. Next to the Hotel Garden in Levanto is a restaurant named Da Tapulin. I had their “Spiedino di Calamari Seppe Gamberi e Pesce Spada,” which is skewered calamari, prawns, swordfish, and cuttlefish. The seafood comes out encrusted with finely grated cheese. Amazing. This is another place we recommend checking out. Also in Levanto is Da Rina. They had the best minestrone soup I’ve ever had in my entire life. It was minestrone with pesto and Parmesan cheese. We also had their smoked tuna and grilled king shrimp. The food there is light and fresh and really amazing. We recommend going elsewhere for your after-dinner coffee, though. One final place in Levanto is Ristorante la Loggia. They have a quaint notice about gluten on their menu. It reads, “We serve without gluten-free.” While most of the waitresses and waiters we had in Levanto were friendly and seemed knowledgeable about gluten, our waitress at Ristorante la Loggia was downright enthusiastic. We had salad and dried beef (like Prosciutto but with beef) with mushrooms and cheese. These two were delicious. My entrée was saffron gnocchi with prawns. This tasted like mac and cheese and was only OK. For dessert, our waitress insisted on bringing me a delicious flourless chocolate torte with ice cream. That was awesome. Despite the pluses of la Loggia, we didn’t end up being that fond of it. It was extremely noisy, and we almost had to get rude to get our check. In Riomaggiore, there is a small place that serves bacon and eggs. They fry it up with rosemary and lots of olive oil. 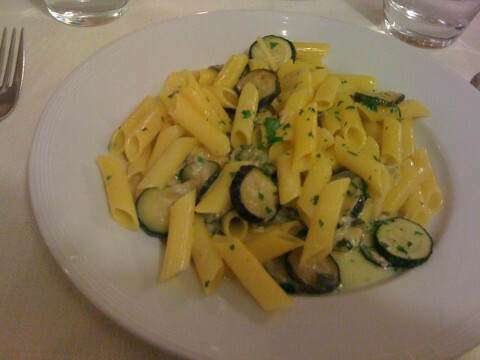 I wish I had written down the name, but it’s one of the meals I think about occasionally and wish I could go back to Italy today and have it again. I don’t think we felt like the Hotel Garden was special, but I think you could do a lot worse, and according to the TripAdvisor website, Hotel Garden is the number one hotel in Levanto. We both agreed that we were glad that we ended up staying in Levanto. It seemed much friendlier and much less crowded with tourists. 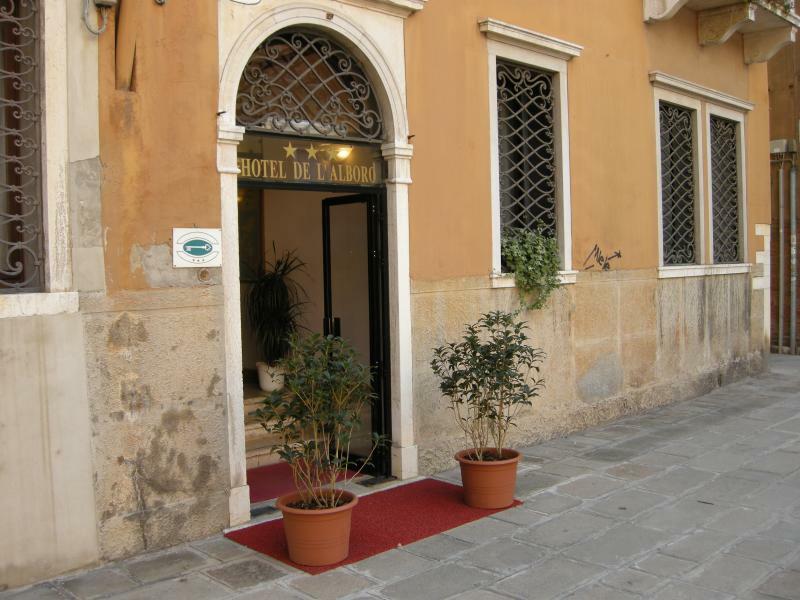 Hotel Gallo is in Tignale, which is right on the west side of Lake Garda in Northern Italy. Lake Garda is about an hour drive from Germany, so there are a lot of German tourists and the multilingual menus there are in Italian first, then German, and then English. The popular travel writer, Rick Steves, says to avoid any restaurant with their menu in three languages, but we found a couple of restaurants where that wasn’t solid advice. As for the Hotel Gallo, we enjoyed our stay there. I’m going to get our complaints out of the way first. Though the place had a newer feel than most of the hotels we stayed in, it didn’t seem as clean somehow. And the beds and pillows were hard (maybe it’s an Italian thing?). We also had some trouble with TV noise from neighboring rooms on our first night. Luckily, the hotel agreed to move us to a different (and in our opinion, nicer) room. Last, the hotel was definitely not fragrance free. The rooms smelled strongly of perfumed soap. It didn’t bother us much because we didn’t spend a lot of time in our room, but I could see it being an issue with someone who is very sensitive to fragrances. Other than that, I can definitely recommend the Hotel Gallo. It is a three star hotel, which means that it’s mostly about providing a pleasant roof over your head. The nicer rooms in the hotel have a really stunning view over the lake and a balcony. They cost a little more, but from our experiences with European hotels, it is worth it to pay a little extra for a nicer room. Most of the staff spoke enough English that there weren’t any language problems, and they were very friendly, especially Fulvia, who was there during the morning and afternoons. We were really happy that our complaint about the noise was handled so kindly. I keep having the experience here in the US that, when you complain, a hotel will immediately start treating you like a burden—or worse. The greatest thing about Hotel Gallo is that they are very accommodating for gluten-free dining! Hotel Gallo has a restaurant on the first floor. For an extra fifteen Euros per person, you can get dinner there. This proved to be very economical AND had the added advantage of being able to eat gluten-free pasta dishes, which I did not once, but twice. 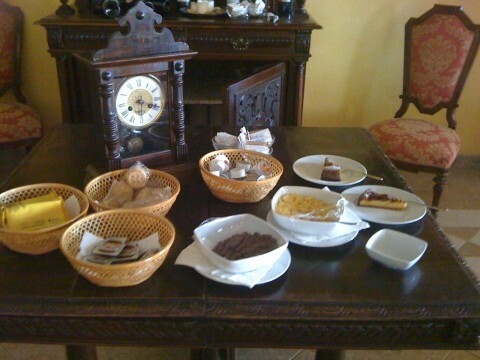 Also, they had a separate breakfast table specially set up for gluten-free guests. This is pictured above, and as you can see, they have quite a selection of gluten-free goodies. Packaged rice crackers, some cookies, two kinds of cereal (yes, that’s a bowl of gluten-free cocoa puffs), and coffee cake. The rice crackers were by Schar and called “Fette croccanti.” The gluten-free coffee cake was gluten-free coffee cake! For our two dinners, I had mixed seafood pasta and curried chicken one night, and then penne pasta with zucchini and seafood in an Alfredo sauce followed by some kind of pork steak the next night. The food was very good and all the vegetables seemed very fresh. The house wine was great, and as everywhere else we went in Italy, the espresso was delightful. Although we can’t say our stay there was perfect, it was among the best places we stayed in Italy and we would go back again. I think it would be a great place to go and spend a lot of time exploring the beautiful surrounding countryside, going on hikes, and getting a massage. The Hotel Gallo has a fitness center, a hot tub, a hamam (which is like a sauna), and if you’re there in late September, you can catch the Tignale Truffle Week. 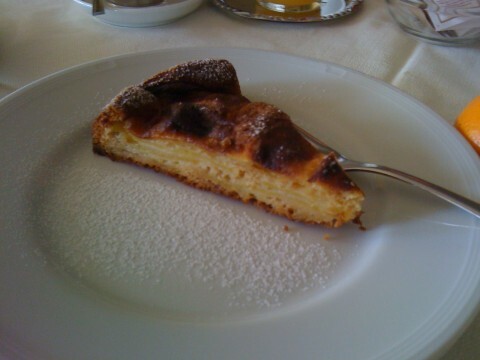 For the gluten-free traveler, Hotel Gallo is a great place to stay in Italy. Gluten-Free Safety Rating: Gluten-Free Friendly But Ask Questions. 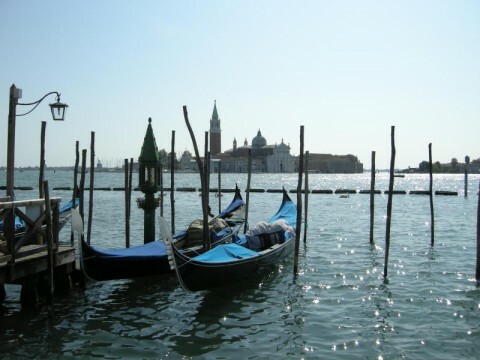 The first place we stayed in Italy was Venice. I loved Venice! Our hotel there was the Hotel L’Alboro. It is a three star hotel, which in Europe means that it’s nice, clean, and has some amenities, but isn’t going to be plush or have amazing service or anything. We thought that the L’Alboro was a little run down but clean. Our room was small by American standards. 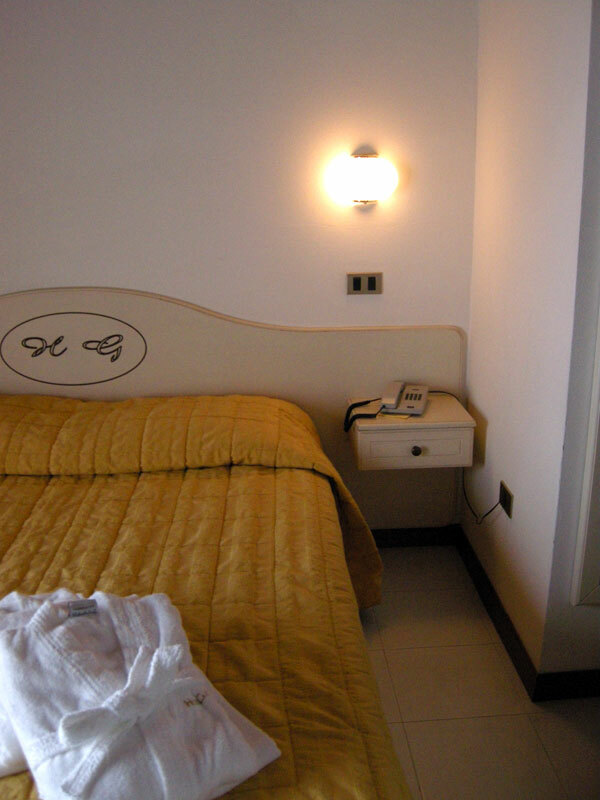 The bed was how we found almost all the beds in Italy: hard with foam pillows. The staff at L’Alboro is very nice and when they found that I was gluten-free, they got me three (three!) bags of gluten-free biscotti and also told me what I could and couldn’t eat in their breakfast area. This was a huge source of relief to me because I was worried about breakfasts there. It was also very kind of them and made me feel special in a good way instead of the usual “high-maintenance” way. There was some kind of altercation over the coffee that had to do with gluten, and I never found out what the deal was, but some Google searches are making me think I had caffè d’orzo, which is a kind of substitute coffee made with roasted barley. So make sure the serving people know that you’re gluten-free. The location is awesome! The L’Alboro is in a kind of quiet out-of-the-way spot very near St. Mark’s Square. It is also a just walk to the Rialto Bridge (where all the night-life seems to be) and The Academy and Peggy Guggenheim Museums. There is a vaporetto (water bus) stop about 50 feet away. Some other notes: Almost all the staff speaks English. Franco and his wife were very kind and Franco showed us photos of his dog and his house. Sienna was having trouble figuring out whether or not to buy a pair of boots. She asked one of the staff and he reported back what his wife thought the next day. The locks at Hotel L’Alboro are the old fashioned kind that use what look like skeleton keys. Very cool! We had a little trouble getting good food in Venice. I think that tourism is to blame more than anything else. When there are lots of tourists around to support bad restaurants, quality suffers. After a few unsatisfying and overly-expensive meals, we decided to stick with recommendations from the staff at our hotel and from our Rick Steves guide. We also started looking very closely at the people eating at restaurants. If the people at a restaurant are just chewing in stunned silence and/or seem unhappy, steer clear! If the people at a restaurant are eating and talking loudly and look like they’re having a good time, go for it. Almost every waiter we encountered in Italy knew about gluten. In most cases all you have to say is “Niente glutine” and they’ll start pointing out what you can eat on the menu. In the rare instances that they don’t know what you’re talking about, you’ll need to pull out a list of offending items and then suggest things you can eat, which is basically what you have to do in the United States. I’ll post more about Italy and list some of the restaurants we visited soon. We’d like to say that we found the Shasta MountInn Bed & Breakfast by doing a search on Gluten Free Bed and Breakfast places. Instead, we were just looking for a place to spend a night in Mount Shasta, California, on our way back up from Los Angeles. The last time we’d been to Mount Shasta was a disaster, because it was a Sunday morning and we couldn’t find anything that: A) Was open, and B) Looked like a place we would want to eat. They have a health food store there, but the selection is basically deli food. 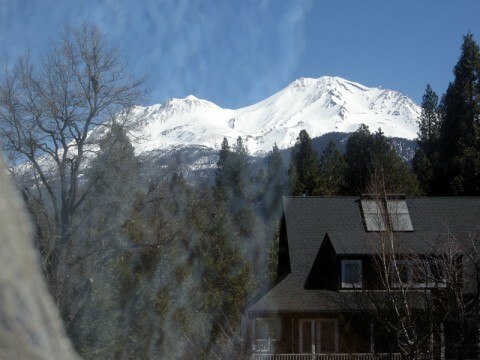 Fortunately, we found the Shasta MountInn Retreat and Spa just through a web search. It has a five star rating on all the hotel review websites and we weren’t able to find anything but rave reviews. So we called them up and while making arrangements to spend the night, mentioned that I was gluten free. The person we were talking to, Dave, said that he had just been to Trader Joe’s and he could make me some gluten free pancakes. (!!!!) I’m sure that we just got lucky and if you want to book a stay at the Shasta MountInn, you should let them know ahead of time if you have any special dietary requests. The house is a Victorian which has been modified to be a B&B. So for example all the rooms have their own bathroom. There is a relaxation room on the top floor with books and movies. They have a sauna, a hot tub, and also offer massages. 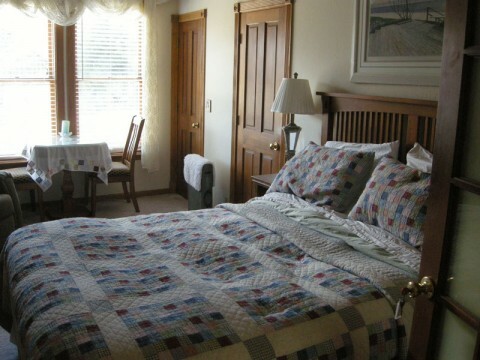 Here’s one of the rooms at the Shasta MountInn. This one has kind of an unusual bathroom layout in that the shower is behind one door and the bathroom is behind the other. The beds are all Swedish Tempur-Pedic® and have a top layer which is that strange “Memory Foam” which makes them very comfortable. For pillows they also have memory foam pillows, but also plenty of conventional ones too. Our room also had two separate heaters. Here’s the view from the room we stayed in. When our host Dave mentioned that he could make me some Trader Joe’s Gluten Free pancakes, I was thinking that he had the pre-made, packaged kind. Instead it turned out that he was making them using the Gluten Free Pancake and Waffle Mix that I reviewed here. It also turns out that he makes a much better pancake than I do, which is really saying something, because I’m a pancake pro. 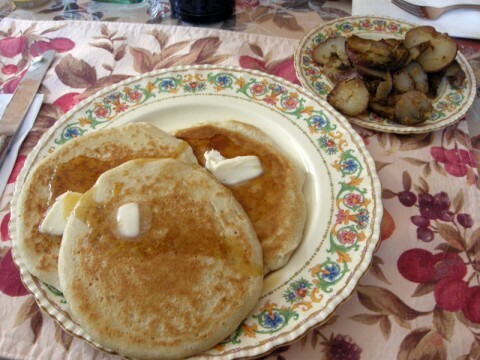 They were also served with home fried potatoes. Did I get a picture, you ask? Why yes I did. When the subject came up, Dave seemed to be aware of different food allergies, and it seemed like he would be able to accommodate a wide variety of diets given enough notice. 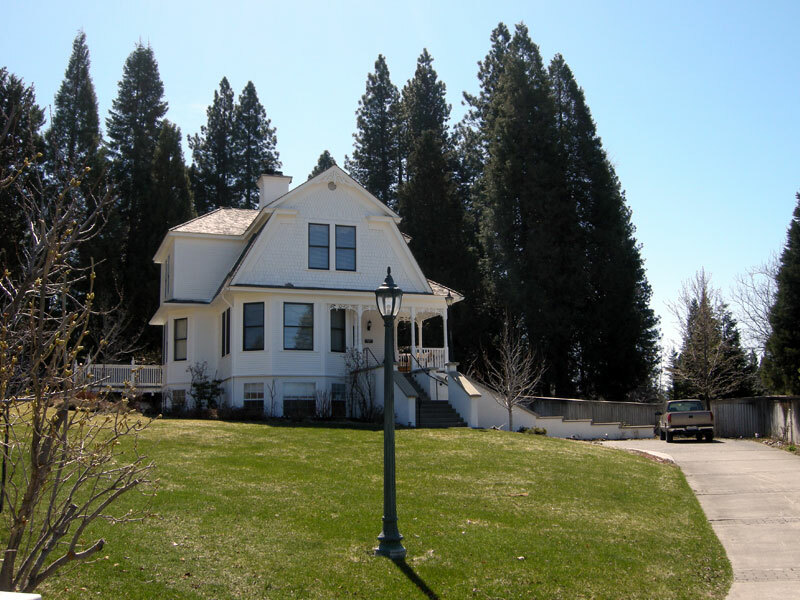 We want to know: Have any Bed and Breakfast recommendations for weekend trips around Portland Oregon? Do you find that most places are at least gluten free friendly? Let us know in the comments!